The Posture Prep Cross Fiber Groomer is more than just a tool. It is a therapeutic approach that should be used on a daily basis to compliment your normal grooming routine. Dr. Pat Bona is something of a Renaissance lady. She has been a partner of the Broad Axe Chiropractic Center since 1987. But it was her passion and love for her horse and his health that motivated her to expand her education to animals and pursue her certification through the American Veterinary Chiropractic Association in 1994. Her journey to better understandadhesions, scar tissue, and the myofascial system began with her own mother’s challenges with abdominal adhesions and the fight to avoid further surgery. Dr. Pat wanted to focus on these dynamics to help restore good posture, health, and comfort to people and to animals, improvingtheir overall well-being. Why Is It Called “Posture Prep”? Preparation is the foundation for success whether you are painting a room, training your dog, or taking your horse to a show. The same applies to helping a body come into better balance towork efficiently in gravity as strong posture is the foundation of good health and longevity. The Posture Prep tool preps the skin and muscles with a massaging motion so they move more freely when exercising. Whether it be a horse or dog, this grooming system will help support andimprove performance, decrease incidence of injury, and improve overall health and well-being. Why Should I Own A Posture Prep Cross Fiber Groomer For My Horse and Dog? The -Gravity is an unyielding force that we cannot defy and it can affect good posture which is the foundation for optimum biomechanics. The Posture Prep tool can help improve posture by breaking up adhesions and scar tissue between muscle and skin. Improved posture is the basis for freer movement, leading to better health and well-being while also enhancing athletic performance and reducing the risk of injury. How Does Posture Prep Cross Fiber Groomer Help Me Warm Up My Horse or Dog? The Posture Prep tool improves the circulation to the muscles, tendons, and ligaments (the myofascial system), so the skeletal system and the nervous system can function more efficiently and effectively and your horse or dog can move more freely. It also helps address the “dents” and “dings" which are actually areas of scar tissue deep in the muscle – the result of bruising trauma that horses often suffer from being with other horses or just out in a field. Even though you may not see them, when not addressed through cross fiber grooming, they can make your horse appear stiff or uncooperative. Dogs can suffer similar injuries during playtime and also benefit from grooming with the Posture Prep tool. The Posture Prep grooming technique starts your horse ride or play time with your dog on the right foot. When Should I Use My Posture Prep on my Dog ? Dogs are truly man’s best friend but wagging their tails and bodies so vigorously with their unconditional love can be detrimental to their own muscles and spine. Puppies and dogs tackleeach other in playful bouts, often on hardwood floors. This may cause cumulative trauma to their bodies and alter their posture, performance, and well-being. Agility and sporting dogs are athletes which need care and attention to their bodies; service dogscan also suffer individual stresses and strains. All can benefit from the Posture Prep and willenjoy the special attention to their hearts and bodies. Whether you have a horse or dog, you are their primary caretaker and partner and this tool canoffer you valuable bonding time with your animal. Is It True That I Get a 6 Month’s FREE MEMBERSHIP To The Posture Prep Resource Center? Yes! The Resource Center is a “members only” site where you can view videos to help you improve and refine your Posture Prep technique. One such video is from the 2012 Wellness Symposium at Hassler’s Dressage at Riveredge. It includes a Power Point lecture on evaluating posture versus conformation, addressing “dents” and “dings”, and two demonstrations on the system. There are articles by several authors and links to other informative websites and the center continues to grow with new memberships. It is worth the price of the package itself. Does Posture Prep Come With A Booklet To Help Me Learn To Use It Wisely? YES!! A 10 page basic instruction booklet is included with the package and on page 10 you will find the logon code to activate your membership on the Resource Center website is where you can view videos on Posture Prepping and review other articles by Dr. Pat along with additional complimentary articles and website links. 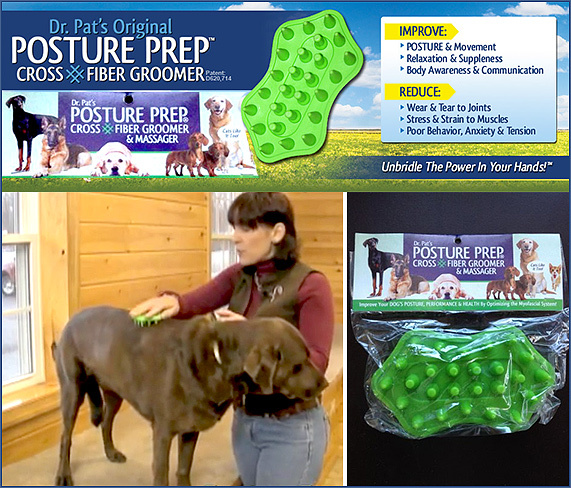 Order Your Posture Prep Cross Fiber Groomer Today! At only $19.99 for horses and $11.95 for dogs, why wouldn’t you want your horses and dogs to feel and perform their best? Call us today and we’ll send you the Posture Prep Cross Fiber Groomer— you’ll love the way your horses and dogs feel— and perform!